The day before yesterday, I received a Honeybaked Ham postcard in the mail. When I looked at it, I knew instantly that it was going to be a wasted effort, and wouldn’t bring in much business for them at all. I see a lot of advertisements that I feel are wastes of time, and money. However, this postcard is so obviously bad almost any change would increase conversion rates. Think about it. If I can make a version in five minutes that I know will bring in more business, something’s amiss. It doesn’t matter that I’m a professional marketer. The people who created this are supposed to be as well. That said, I’m sure they are wonderful people, and have a lot of talent, skills, and experience. This postcard makes me think there is a flaw in their process, or they are overworked and have too much to deliver with short deadlines. Either way, this is evidence that bad marketing can happen to good companies. Here you can see an example of the original postcard. I think the copywriter was trying to be too cute. Using the word” unwrap” suggests the holidays, and ties in to the way you interact with their product, but other than being a verb, it doesn’t sell the product. Exceptional is a generic term. 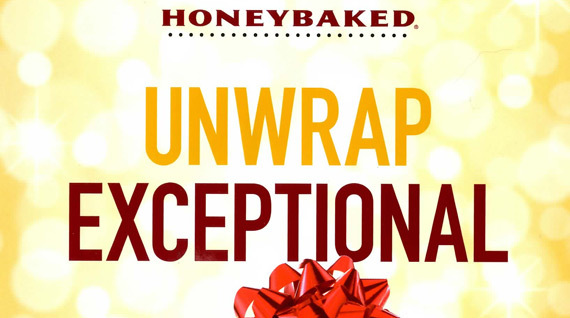 I’d rather see “very good ham” than “unwrap exceptional.” You never want your customer to have to think about what you’re trying to say in order to make sense of it. People won’t make the connection for you, you have to make the connection for them. Also, “we’d love to see you again” is verbiage you would use for a reacquisition campaign. It doesn’t make sense here. Really, it seems like they threw text on the front of it just for design, because it appears the important part is the coupons on the back. The copy on the back isn’t bad but they use the word Christmas, and they ask me to come back again. I haven’t been to Honeybaked ham for two years. At this point, I don’t believe I still qualify for a reacquisition campaign. I actually think they would’ve been better off sending a front end campaign marketing piece to me. As you can see, my version is simple, and obvious. Even though it took literally five minutes to change the background, think of new text, identify a font that looks similar, and save it – I think my version wins hands down. 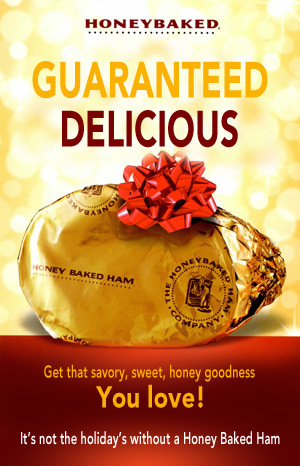 There are two things I think of when I think of Honeybaked ham: spiral slicing and sugar-honey glaze. Nothing about the original version of this postcard says anything about the glaze or the spiral slicing. Big mistake in my book. I think my version is clearer, and I wish I could test it against the control. What do you think about this Marketing Example? 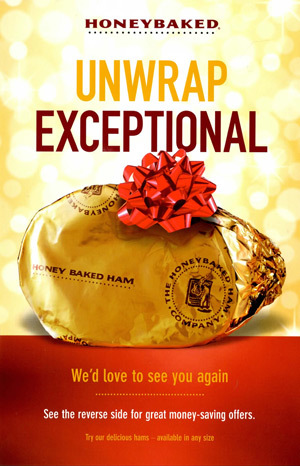 Do you understand the Honeybaked ham postcard? Do you think the original version is better? How would you change it? I’m all ears, and eager to hear your opinion. Let me know in the comments below.